"Something like that will release 100 million megatons of energy. It plows through the atmosphere in a second or two. Whether it's a deep ocean or not doesn't matter; it's so much bigger than the depth of the deepest ocean that it just blasts out a huge crater. This is going to obliterate all the life on a continental scale. Anything that's unprotected is going to die within the first minutes after impact." One of the conceptual problems with most science shows dealing with yet-to-happen future events is that there's no footage to show, no definites to comment on. It's all big if's. The format is typically smart guy talking head speculation, periodically augmented by some computer animations to reinforce what's being talked about. Not that that's bad�because scary science stories about what cataclysmic tragedy might be lying in wait for Earth are always welcome in my home. I like to know what might be lurking, whether it's in my future or not. 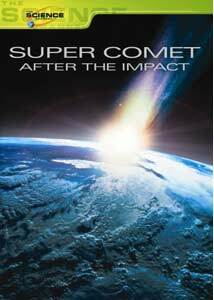 Super Comet: After The Impact from Image is a Science Channel/Discovery Channel special that addresses the big "what if's" of a massive outerspace rock smashing into our planet, much like what may have happened to wipe out the dinosaurs. But instead of simply having experts sit around and analyze or dissect what they think might take place after the world as we know it ends, this clever special borrows from the summer action movie blockbuster formula. A small cast of characters in different parts of the world (Hawaii, Paris, Mexico, Cameroon) are each involved in their own individual dramas based on the days leading up to and the months after the big impact, and in between the real experts do a war room round table to tell us what's likely to happen next. It's a neat way to dress up all the speculating, and combined with a big, dramatic score the whole package carries it off pretty well. Like a mini-movie. Even the visual effects fall within acceptable ranges, especially considering I have seen far worse on Sci-Fi Channel original movies. There's even an Armageddon-style nuclear deflection attempt that fails miserably in the opening minutes as a nervous family in Paris watches on television, setting up the inevitable, which based on the title shouldn't be that much of a surprise. There isn't really a whole lot of good news here, considering a lot of us would likely fall into the "dead upon impact" category. But it's a fairly exciting presentation, nonetheless, even if some of the acting is a little overdone at times. Director Stefan Schneider keeps a quick pace to things, bouncing around what's left of the planet as things get worse and worse. The chatter about survival and the human spirit is hopeful, I guess, yet it's the wholesale destruction that's the meat-and-potatoes here, and the experts don't soften the potential ugliness at all. Image Transfer Review: I've downgraded the overall image transfer slightly just because it's presented in a nonanamorphic 1.78:1 aspect ratio. Too bad, because the rest of the elements look pretty solid overall, with bright, vivid colors (even during the effects sequences). No evidence of dirt or nicks were present. HD viewers may be a bit disappointed, but this is a probably a slight improvement over original broadcast quality for most SD viewers. Audio Transfer Review: The 2.0 stereo mix gets an active workout for a science doc, working out the big dramatic feature film caliber score cleanly at all times. Voice quality is clear, with the narration sounding full-bodied and ominous. Extras Review: No extras, other than a preview for iDiscovery: Atlas, while the main feature is cut into 11 chapters. Instead of a bunch of talking heads just yakking about what might happen, this Science Channel/Discovery Channel special presents it all like was a big summer action movie. Fun stuff, in a gee-I-hope-this-never-happens kind of way. Worth a rental, especially if you're a science nerd with an eye on the skies.